Hardcover, 10.5 x 12.25 in. / 272 pgs / 140 color. Text by Douglas Dreishpoon, Stephen Zaima. Over the course of five decades, California-based painter Max Cole (born 1937) has refined her visual language into a series of vertical and horizontal lines, and a restrained palette of gray, black and white. With up to 80 layers of paint, her paintings also comprise areas of unpainted linen, subtly interchanging the texture of paint with the texture of fabric. Upon closer inspection, these paintings reveal tiny, imperfect hatch marks that, when examined from afar, oscillate. As Cole says, “The result is quiet, inward and meditative, transcending the physical.” Cole developed as an artist in Los Angeles in 1964–78, began showing at Sidney Janis in 1977, and then moved to New York, while also maintaining a studio in Germany and exhibiting in Europe during the '80s and '90s. She now lives and works in the Sierra foothills of northern California. Her work is in the permanent collections of the Metropolitan Museum of Art, MoMA and Albright-Knox Art Gallery. 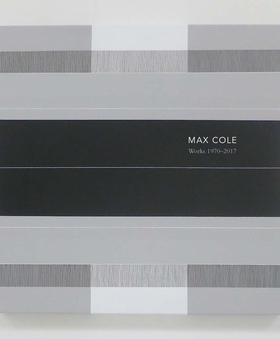 This volume presents an overview of Cole's career over the past half-century. FORMAT: Hbk, 10.5 x 12.25 in. / 272 pgs / 140 color.